Sparkle Up Your Roman Catholic Catechism Class! 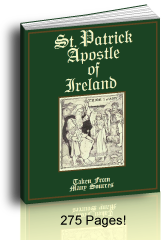 Saint Anne's Helper Catholic Catechism Resources for First Communion through Confirmation preparation. Baltimore Catechism No. 1 and No. 2 downloads. 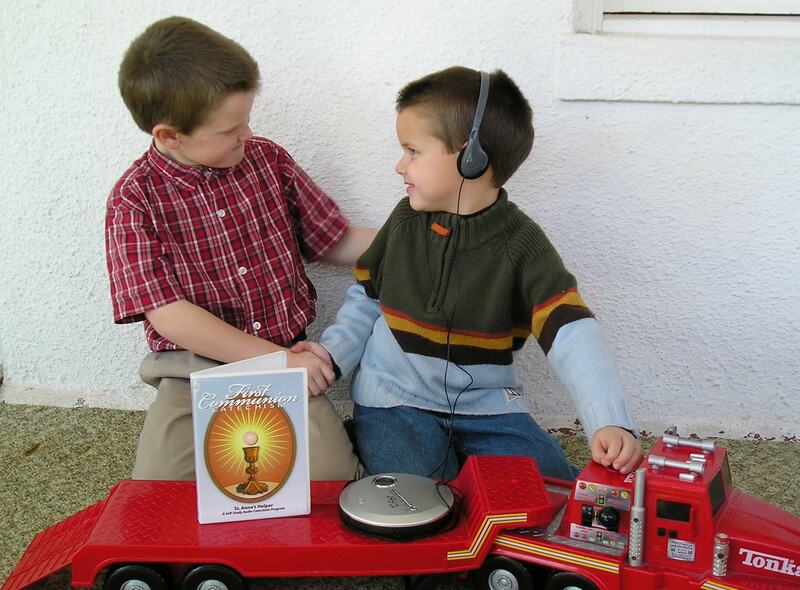 Children and adults love Communion and Confirmation audio books. Catechists love the CCD and catechism worksheets. Parents and teachers will love that their children can keep the Faith. 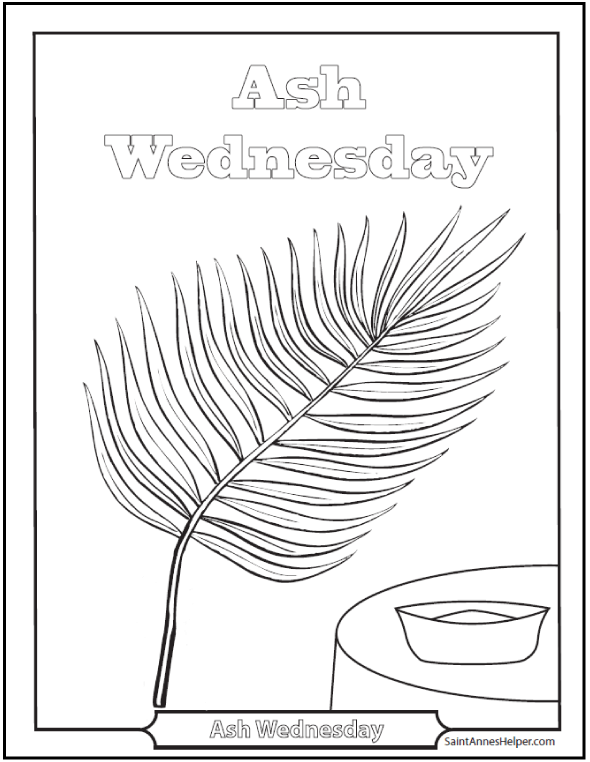 You'll find worksheets, audio Baltimore Catechism, Catholic coloring pages, and prayers for Catholic religion class, homeschool, and Sunday school. 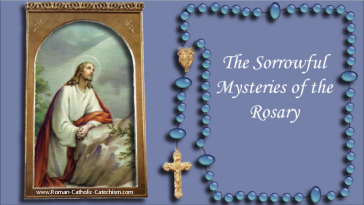 Sorrowful Mysteries of the Rosary video with words to the prayers. Do you need catechism ideas? Need a Catholic tutor? Learn and memorize with audio downloads. Need a holy day reminder? Sign up for a monthly ezine. Teaching catechism? 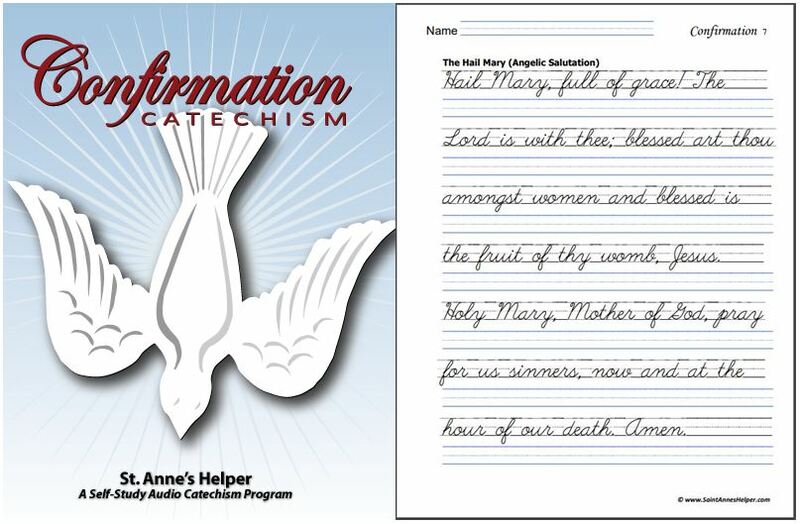 Use catechism worksheets for Communion and Confirmation in both manuscript and cursive. Learning about saints and feast days? 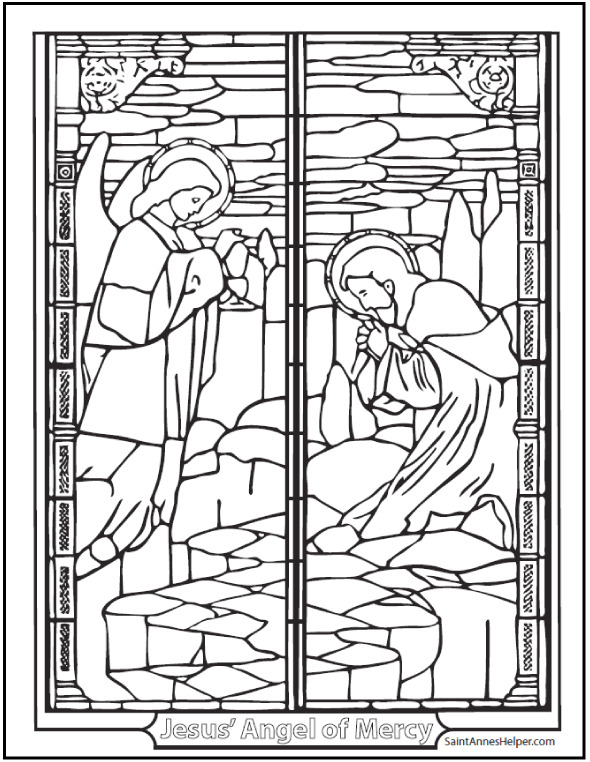 See Catholic coloring pages here. Here's what I've found: Our coloring pages are our most popular product. 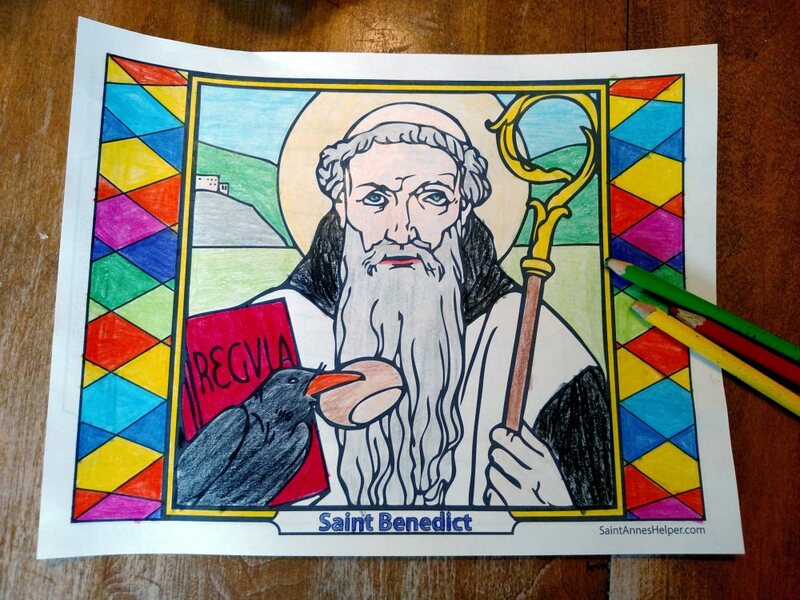 Yet here's what goes with them: Our worksheets help you teach the beautiful Catholic faith that goes with the beautiful Catholic coloring pages. Since the catechism is generally the same throughout the years, you can use these catechism printables for many years to come. Levels? Use the manuscript version with young children. Use the cursive versions to review what your children learned the previous year. The information will always be true. One danger in having a stack of twelve books for different levels is that religion looks overwhelming. Yes, the material grows in depth, yet it's super helpful at any age to realize that the Catholic Faith is the same throughout the years. Our downloads excel at helping your students review the basic Catholic catechism beliefs. Do your children know the Catholic Ten Commandments? Do you? Finding a truly good Roman Catholic catechism is important in today's environment. Every word matters. Why? It's important to final perseverance to "get it right". Certitude helps perseverance. Catholic Truth. God made us to seek truth, but how can you find and pursue in the Truth with fluffy or compromised books? Another thing, often in our days, the whole family learns the Catholic beliefs together at the same time. Saint Anne's Helper shows adults the quick way to higher understanding and gives you resources to make it interesting for your children. The more sacraments you receive, the more prayers you pray, and the better the books that you feed your mind and your children's minds; the better lives you will live. The goal is a happy Catholic family all together in Heaven. Concise. It doesn't take a ton of books to learn the basics. Once you know the basic beliefs, about 120 questions and answers and about ten prayers, you'll know the backbone of what you need to learn in order to receive the sacraments and to keep the Faith for life. Inexpensive. Non-consumable tutor on tap. St. Anne's Helper helps you and your children learn the Faith: the Apostles' Creed, Ten Commandments, sacraments, and prayers. Add in stories of the Saints and you've got a wonderful program. Easy to learn. Audio recordings and worksheets make it easy for both children and adults to learn the Baltimore Catechism's Ten Commandments, prayers, and the answers for First Communion and Catholic Confirmation. Why is Saint Anne our patroness? She is the patroness of those who teach their own children. She can help you teach your children or your catechism class about Baptism, the Holy Eucharist, Confirmation, and the general truths with an audio Baltimore Catechism. 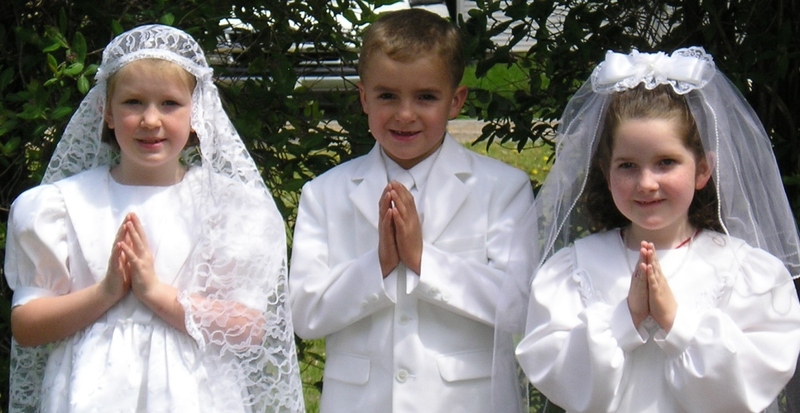 Are you teaching the Faith to First Communicants or those preparing for Catholic Confirmation? Your students will learn to know, love, and serve God easily using worksheets and audio Catholic catechism downloads. They're great for memory work! These downloads can help you teach the basics for catechism class with audio recordings, ebooklets, and coloring PDF pages for Communion and Confirmation preparation. Buy them now, file them, and use them in just a few minutes. Would an audio recording make it easier for you and your children to learn the Catholic prayers and catechism answers? One child could not focus even one on one. Solution? Earphones. The rest was easy. Are your own children not learning their Catechism in school? Let's face it. Even when the school makes an effort, many of the programs and books used don't teach the catechism facts well. Others pad the catechism with so much fluff that it is a monumental effort to chug through the books. Be assured that there's no need for that. Others simply do not have time for children who need help academically. St. Anne's Helper downloads to the rescue! They help you teach religion much easier. Are you learning the Roman Catholic catechism as an adult and looking for short cuts? You need audio Baltimore Catechism CDs or downloads to listen when you're driving or doing chores. They have the same questions and answers on the printable text you can read or listen. Do you need handwriting practice worksheets and coloring sheets for homeschooling without the repeat expense of consumable workbooks? 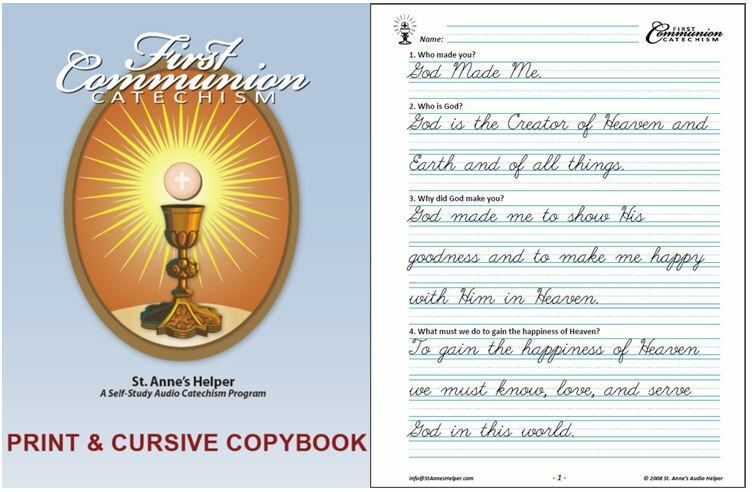 Use St. Anne's Helper's manuscript and cursive writing worksheets to let your students copy such treasures as the Roman Catholic Prayers and the Ten Commandments easily - all from the Baltimore Catechism. These downloads also are a wonderful help for knowing how to answer the Communion and Confirmation quizzes. Practice writing the quiz questions and answers can improve both handwriting and spelling skills, not to mention memory work for catechism class. 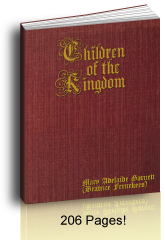 Find them on our Catholic catechism Order page. Roman Catholic Saints - Thank you Jim and Gwynne. Aquinas and More - Thank you Ian and Paula. Emmanuel Books - Thank you Larry and Paola. Catholic Catechism Class - Thank you Matthew. May God grant the increase. 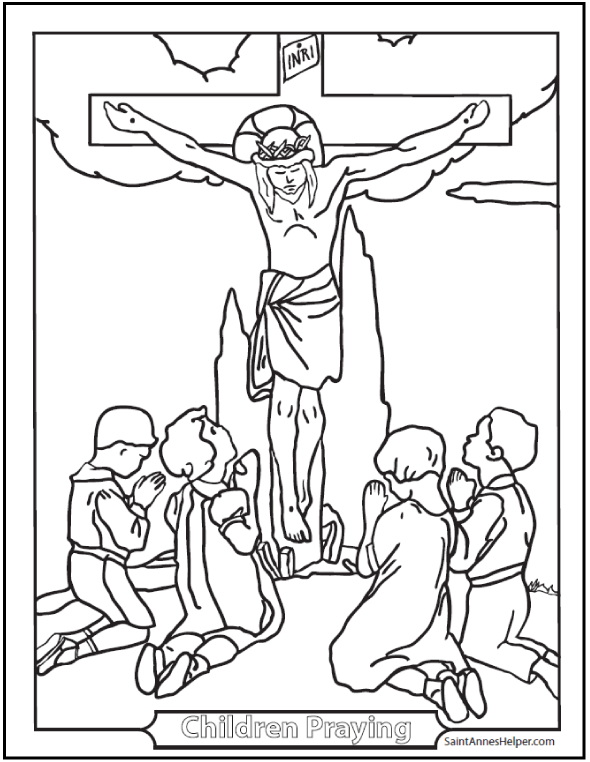 See Catholic Catechism Coloring printables here. Our printable coloring ebook has 483 coloring printables, many of which are throughout this site as free samples. 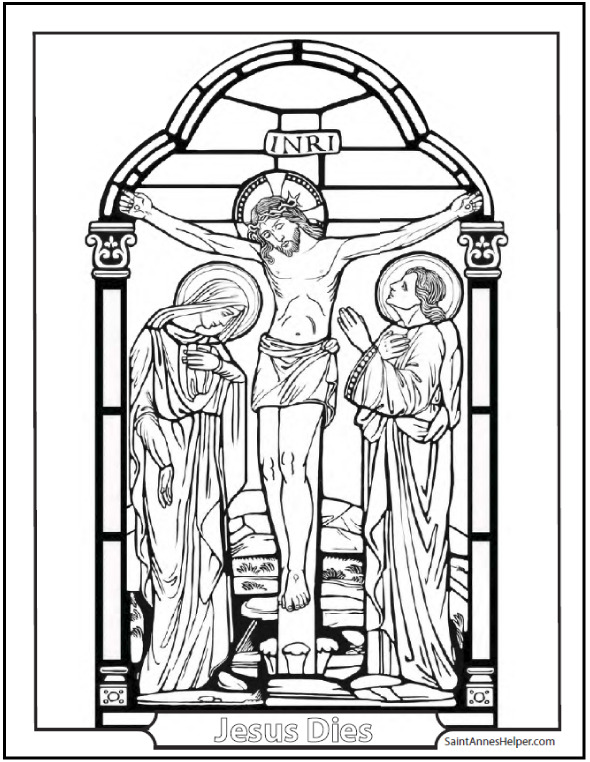 Over 100 specifically Catholic coloring pages. 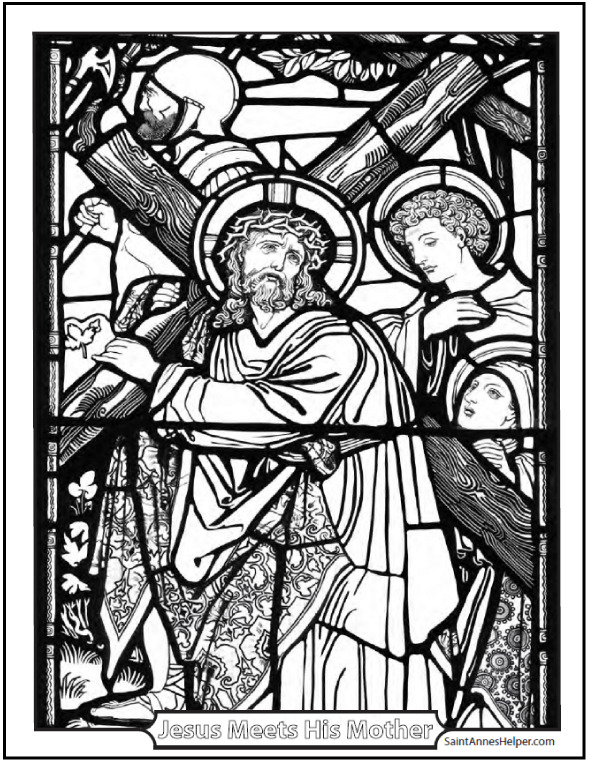 Many are from old Baltimore Catechism pictures and stained glass windows. The bundle has files separated as to seasons, etc. so that you can print pictures for your students for the Advent, Christmas, Lent, and Easter seasons. Buy the bundle in one handy download. Use in your Catholic catechism class, homeschool, or family setting. Separately there are also files of many animals, plants and seasons. This way you have easy access to PDF coloring pages to print without having to be online... and the children can make their own gifts or keepsake coloring books throughout the year! Order Baltimore Catechism Audio Downloads Here. The content of these Roman Catholic catechism resources are faithful to the Magisterium and are recommended by the local Bishop, by many Catholic schools, and by most Catholic homeschool companies. Briefly, the audio Baltimore Catechism teaches that the reason that you exist is to know, love, and serve God in this world so as to be happy with Him in the next. Give the gift of Faith by teaching others the same. Thank you for visiting Saint Anne's Helper. 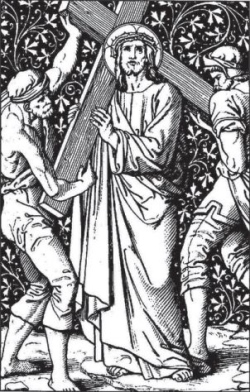 May God grant you a holy life and final perseverance. Saint Anne's Helper Catholic Catechism top of home page.